Y'all... I'm just going to go ahead and throw it out there - this is hands-down my favorite creation thus far. I seriously had to stop myself from getting seconds. 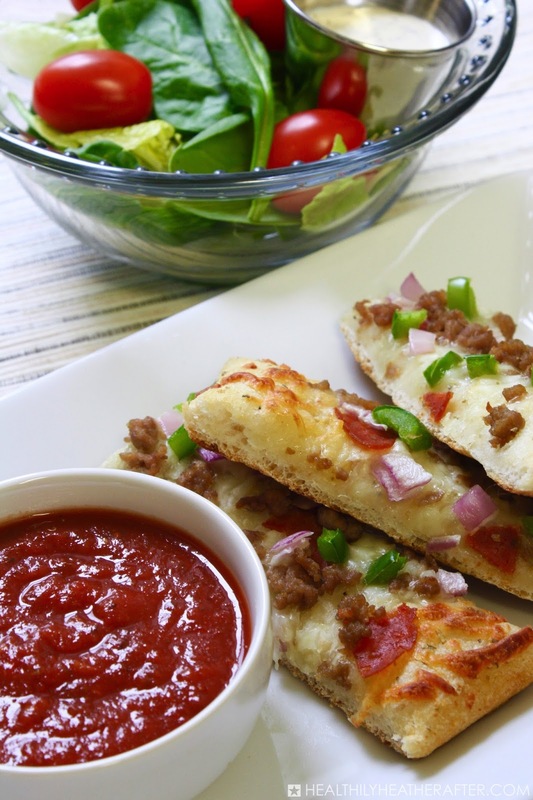 If you like pizza and Philly cheese steaks, I promise you will love this recipe! 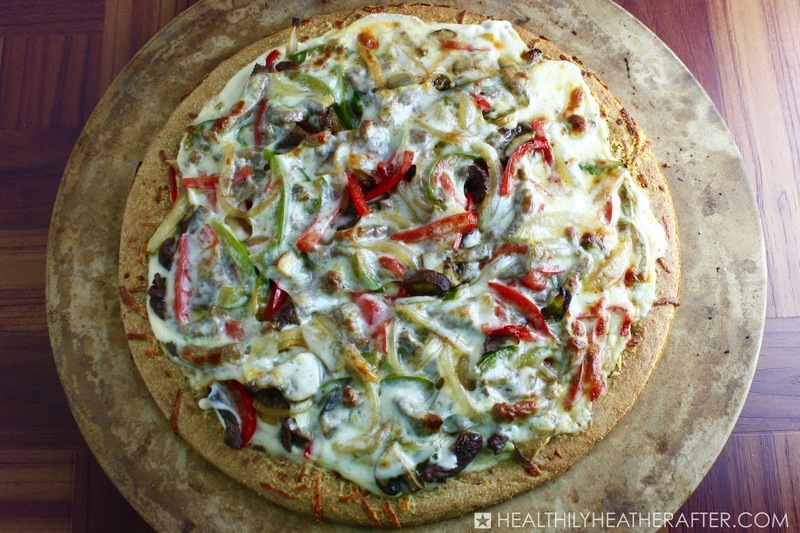 You get to enjoy a delicious combination of these foods for only 6 SmartPoints a slice, which is a win-win in my book! I'm not entirely sure how this idea came to me, honestly. Perhaps I thought of it because I'm always in the mood for pizza? That's definitely a possibility! Ultimately, it doesn't really matter how I thought of this dish, because you get to enjoy it either way! The best part of this pizza, in my opinion, is that it tastes like you are consuming 20 SmartPoints a slice. In other words, it certainly doesn't taste like "diet food." 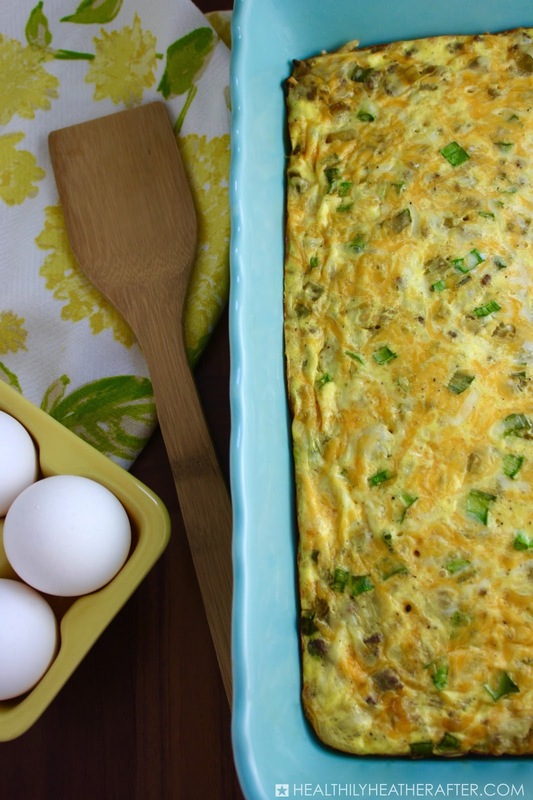 Give this recipe a shot - you won't be disappointed! 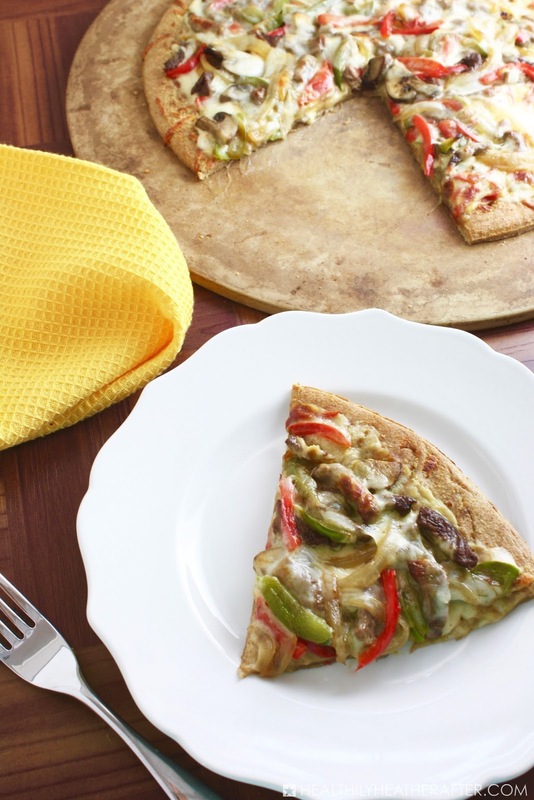 If you love pizza and Philly cheese steaks, this recipe is for you! It may be low-calorie, but it certainly doesn't taste like it! 1. Pre-heat the oven to 450 degrees, and place the pizza crust on a pizza stone or baking sheet. 2. In a small bowl, melt 2 tablespoons of the butter. Mix in the garlic powder and grated parmesan cheese. Set aside. 3. Spray a pan with cooking spray. Add the sirloin steak, Worcestershire sauce, and salt to the pan. Cook over medium-high heat for 3-4 minutes, stirring occasionally and turning the steak to cook on all sides. 4. Remove the steak from the pan and set aside, leaving the juices in the pan. Reduce heat to medium and add the remaining 1/2 tablespoon of butter to the pan. 5. 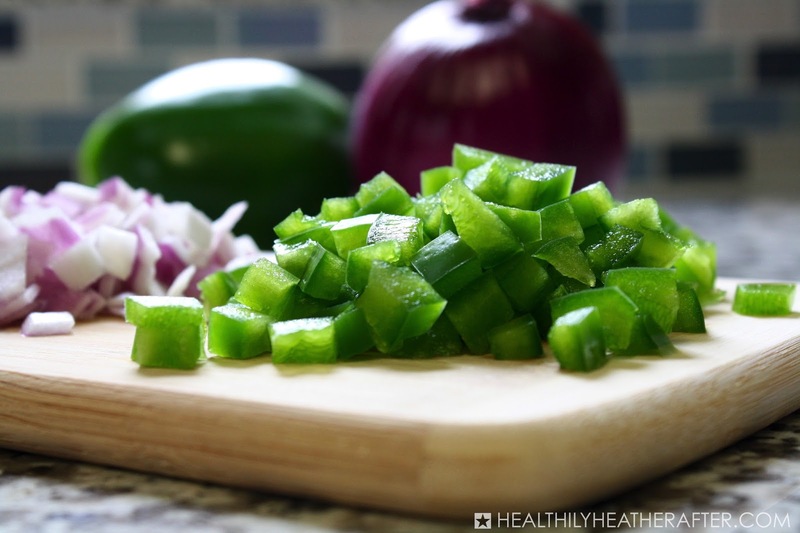 Once the butter has melted, add in the bell pepper and onion. Cook, stirring occasionally, for 7-8 minutes, or until the vegetables are soft. Add the mushrooms and cook for an additional 2-3 minutes. Add the steak back in, mixing it to combine with the vegetables. Remove from heat and set aside. 6. Get your butter mixture from earlier and brush over the entire pizza crust. 7. Spread the alfredo sauce evenly over the pizza crust, leaving about 1 inch all the way around the edge. 8. 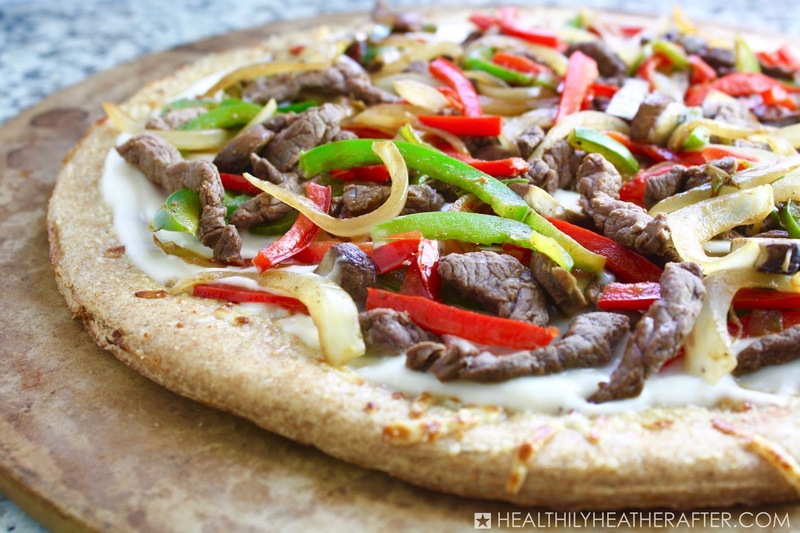 Sprinkle the steak and vegetable mixture evenly over the pizza. 9. 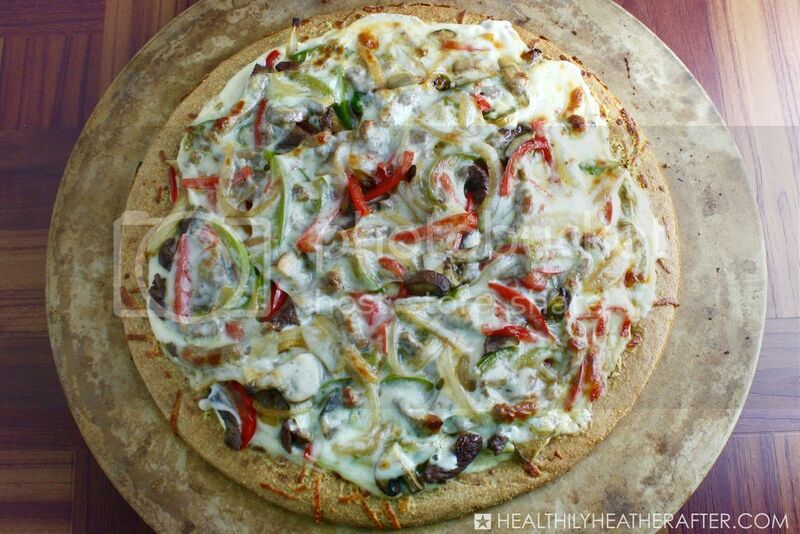 Place the provolone cheese on the pizza, covering as much of the vegetables as possible. 10. Place the pizza in the oven and bake for 10 minutes. Turn the broiler on and cook for an additional 1 minute. Be sure to watch the pizza closely to make sure it doesn't burn! My husband has always been a huge fan of cherry pie, and if I had my choice, I'd choose cheesecake over pie every single time. 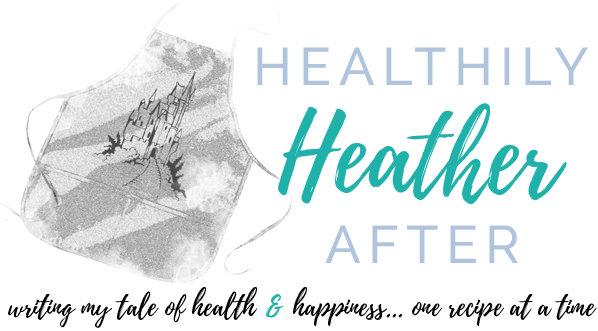 Unfortunately, both of these delicious desserts are typically super high in calories and sugar, making them not very Weight Watchers-friendly. My Mini Cherry Cheesecake Pies, on the other hand, come in at only 4 SmartPoints each, so they are the perfect low-calorie treat! 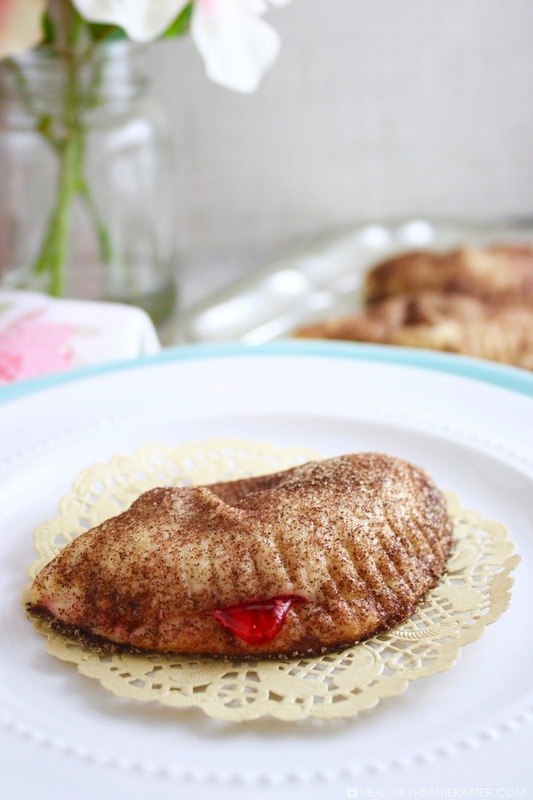 Not only that, they satisfy both mine and my husband's favorite dessert cravings - even better! Perhaps the best part of this dessert, though, is how ridiculously easy they are... because let's be honest, I'm pretty unlikely to make a dessert recipe if I know it will take me a long time or if it has a million ingredients. 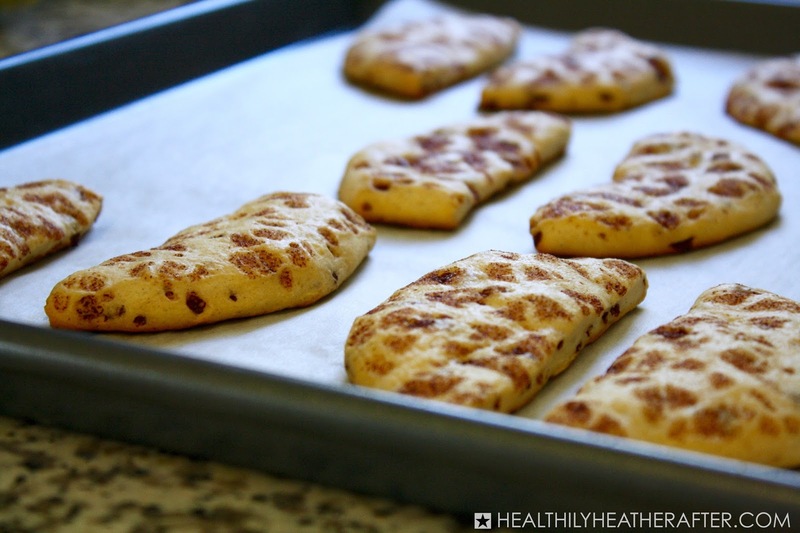 While this recipe is definitely husband-approved, I'd be willing to bet the kiddos would gobble these up, too! After all, who doesn't love a cute little hand-held dessert? 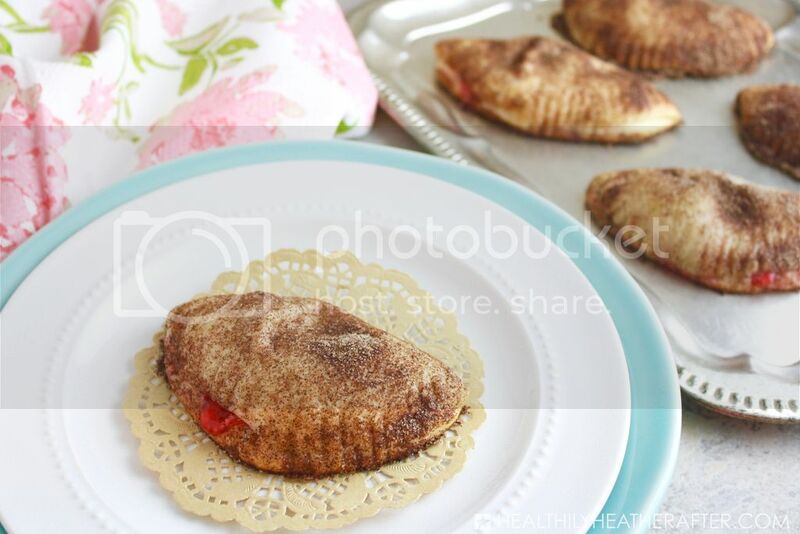 This recipe combines cherry cheesecake and cherry pie in one delicious, low-cal, hand-held treat the whole family will enjoy! 1. Pre-heat the oven to 375 degrees. Line a large baking sheet with parchment paper. 2. 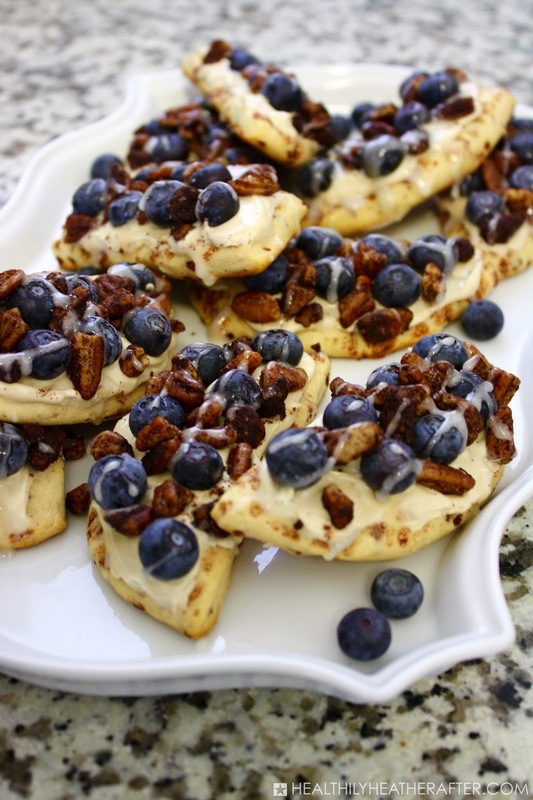 In a small bowl, combine the cream cheese, vanilla extract, Splenda, and 1/2 tablespoon of cinnamon. Mix until well-blended. 4. Fold the biscuit in half, and seal the edges by pressing the tips of a fork all the way around the outside. 5. Place the biscuit on the prepared baking sheet. Repeat this process for the remaining biscuits. 6. Using a pastry brush, spread the butter on the top of each biscuit, coating completely. 7. In a small bowl, mix together the sugar and remaining cinnamon. Generously sprinkle the mixture evenly over the top of each biscuit. 8. Bake in the oven for 12 minutes, or until the tops are golden-brown. I don't know about you, but I sure do adore a good slice of pizza. Something about the delicious combination of melty cheese and flavorful toppings gets me every time! 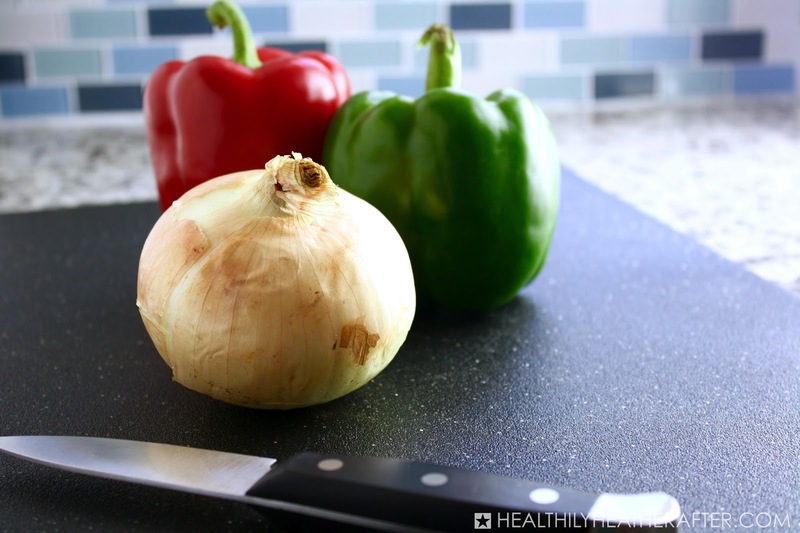 Since pizza can be pretty high in the SmartPoint department, I often use some of my favorite ingredients to make pizza at home and save some calories! Although I usually order my pizzas with pepperoni, pineapple, and jalapeños (yum! ), my Pepperoni and Sausage Pizza Dippers are topped with turkey pepperoni and lean Italian sausage, along with chopped bell pepper and red onion to pack in a few more veggies while also upping the flavor! 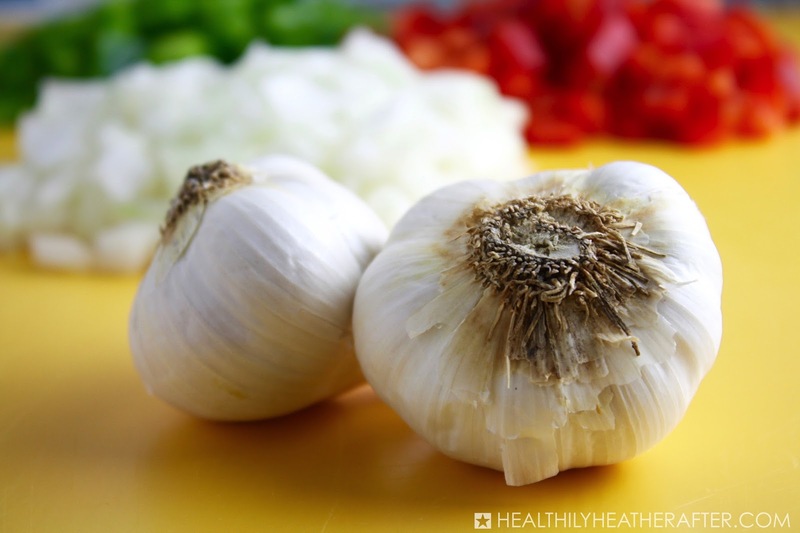 I think the best part of this recipe is the addition of a garlic butter mixture that gets brushed on right before adding the cheese and all the other toppings! 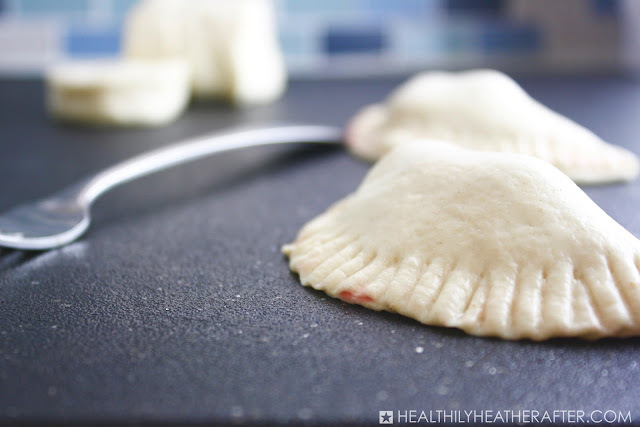 If you haven't figured it out already, these pizza dippers are a tad different than your typical slice of pizza, as you don't add any sauce to the pizza itself! Instead, this delicious finger food gets dipped into the pizza sauce one bite at a time! Feel free to change up any of the toppings to fit your tastes - just be sure to note that it might change the SmartPoints value! These pizza dippers omit the addition of pizza sauce on the actual pizza itself. Instead, enjoy your pizza sauce as a dip once the pizza is done baking! 2. While the oven is pre-heating, cook the Italian sausage in a small pan over medium-high heat for about 5 minutes or until lightly browned, breaking it apart with a wooden spoon or spatula as it cooks. Remove from heat and set aside. 3. 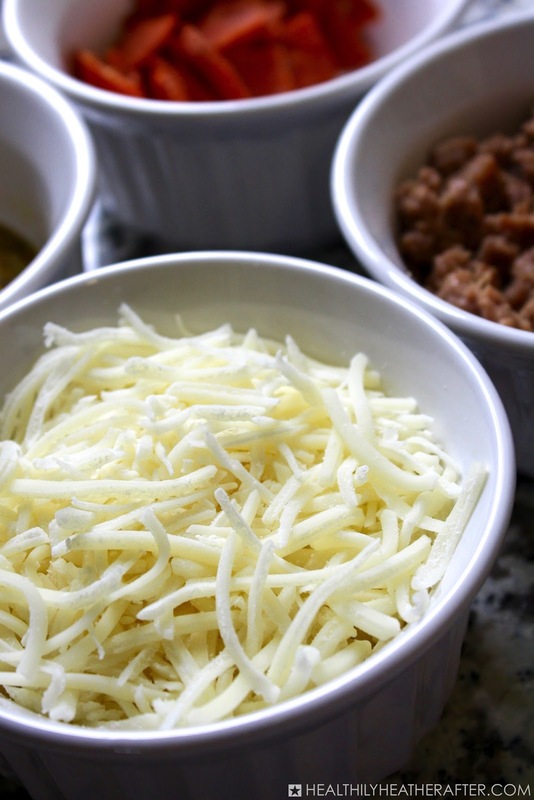 In a small bowl, mix together the melted butter, parmesan cheese, garlic, and Italian seasoning and set aside. 4. Unroll the pizza dough onto the parchment paper, flattening a bit with your hands to make sure it is an even thickness throughout. 5. 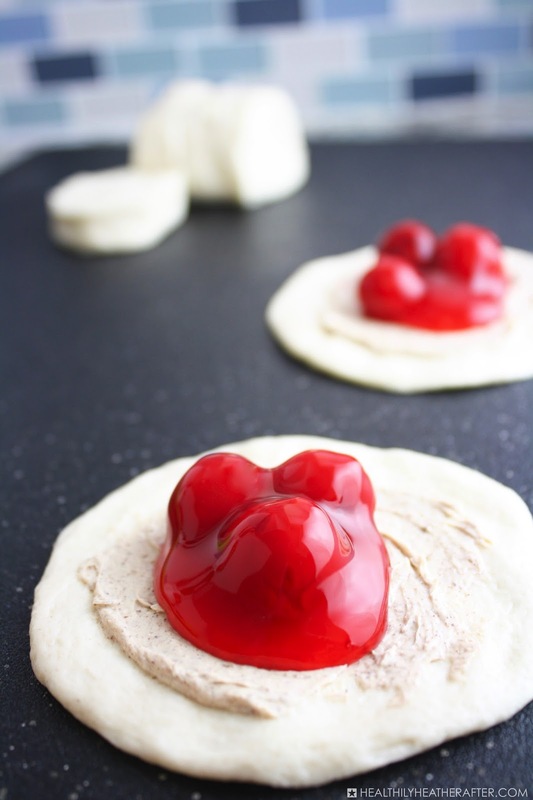 Using a silicone basting brush, spread the butter mixture evenly across the top of the pizza dough. 6. 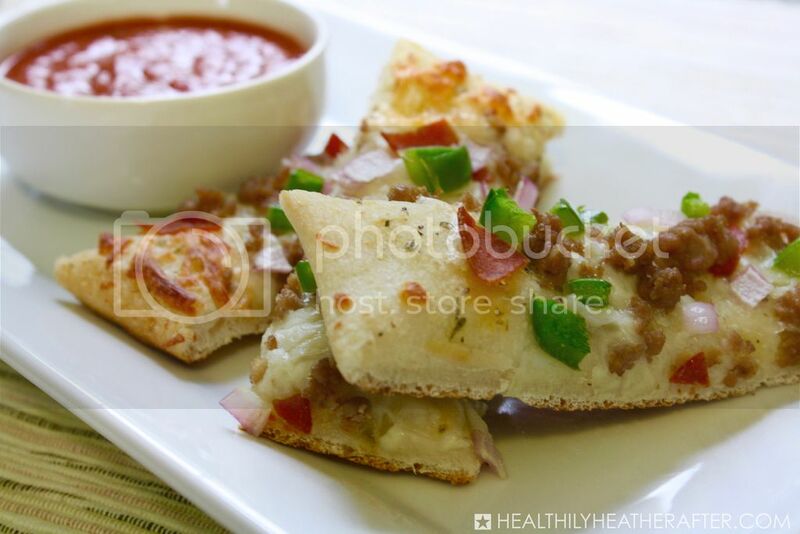 Sprinkle the mozzarella cheese over the entire pizza dough. Add the pepperoni, cooked Italian sausage, and diced pepper and onion. 7. Bake in the oven for 12 minutes, or until the edges are a nice golden brown color. 8. Remove from the oven and allow to cool for 3-4 minutes. Use a pizza cutter or sharp knife to cut the pizza into 16 equal pieces. 9. Serve with pizza sauce. I may be thirty (or twenty-nine plus one - because it sounds so much better), but I still remember waking up when I was just a kid on Saturday mornings to the scent of freshly baked cinnamon rolls. I don't know about you, but that sweet, cinnamon smell just warms my heart and brings back such fond memories from my childhood. These days, I'm all about recipes that use everyday ingredients, are easy to make, and don't contain an unimaginably high number of calories. 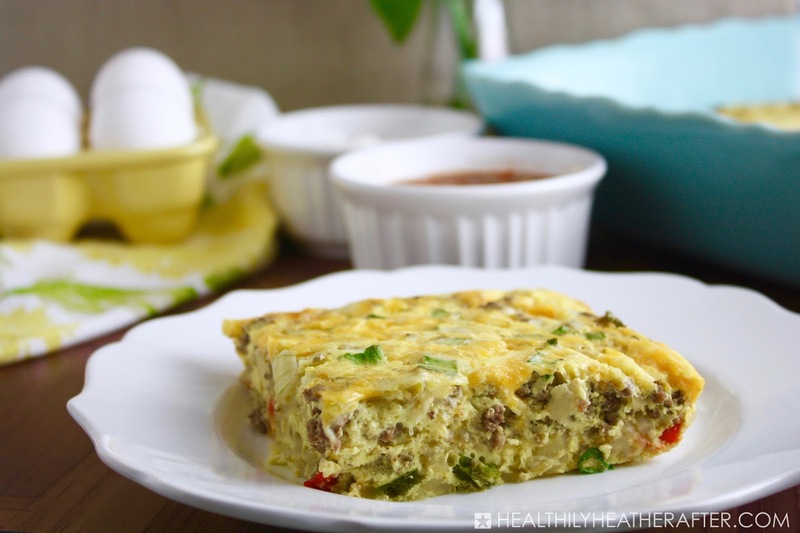 Believe me when I say that this breakfast treat definitely fits the bill! 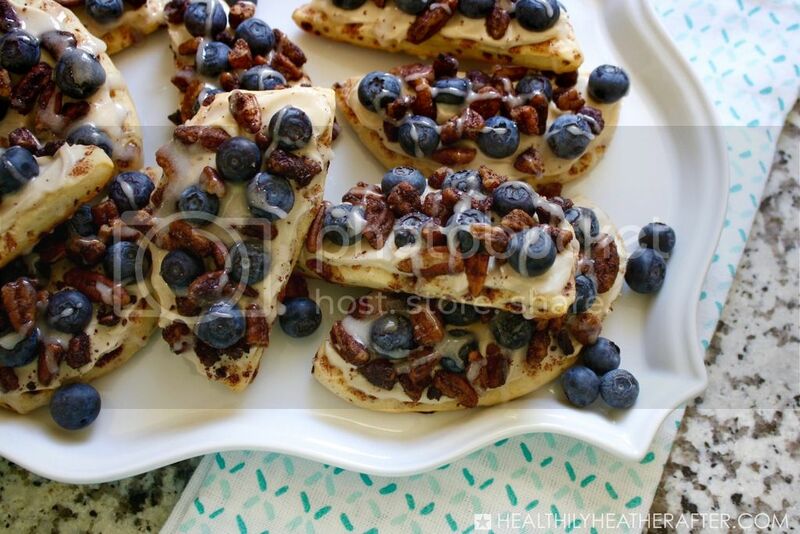 My Blueberry Cinnamon Roll Breakfast Pizza recipe turns a simple package of Pillsbury Cinnamon Rolls into something special by incorporating cinnamon and sugar toasted pecans, a delicious cream cheese frosting, and blueberries, of course! With a bit of sweetness, crunch, and juicy blueberry goodness in every bite, it's hard to eat just one! This Blueberry Cinnamon Roll Breakfast Pizza recipe turns a simple package of Pillsbury Cinnamon Rolls into something special by incorporating cinnamon and sugar toasted pecans, a delicious cream cheese frosting, and blueberries, of course! 1. Pre-heat the oven to 375 degrees. Line a baking sheet with parchment paper. 2. Open the package of cinnamon rolls, setting the icing aside. Separate each cinnamon roll on a cutting board and use your fingers to flatten to about 1/8 inch thick. Cut each cinnamon roll in half with a sharp knife, creating 10 half-circles. 3. Move the cinnamon rolls to the lined baking sheet, about two inches apart, and bake for 8-10 minutes or until golden. 4. While the cinnamon rolls are baking, mix the cinnamon, Splenda, and 1 teaspoon of brown sugar in a small bowl until well-combined. 5. Melt the butter in a medium-size skillet over medium heat. Once melted, add the pecans and stir, coating evenly with the melted butter. 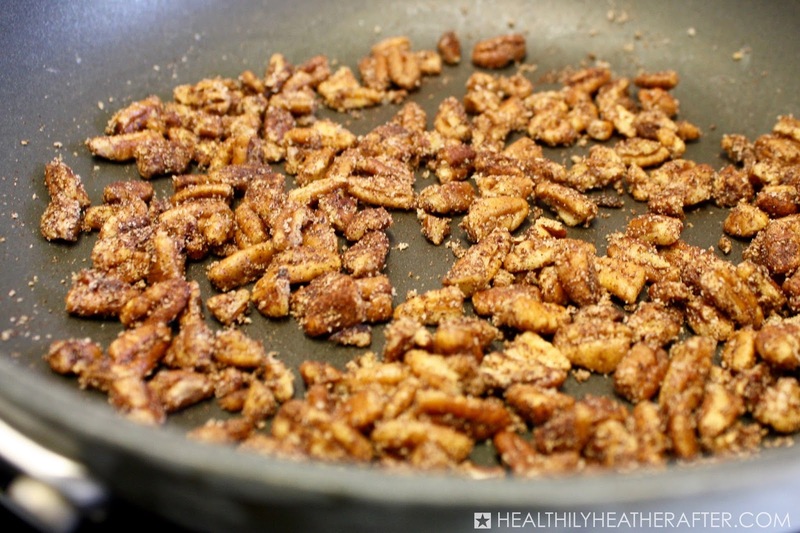 Sprinkle the cinnamon sugar mixture over the pecans and continue stirring for about 4 minutes until the pecans have a slightly crunchy, sugary coating. Remove from heat and set aside. 6. In a medium-size mixing bowl, combine the reduced fat cream cheese, vanilla extract, sugar free maple syrup, and remaining brown sugar. Beat with a hand-held mixer on medium speed until well-combined. 7. Once the cinnamon rolls are cooled, spread an equal amount of the cream cheese mixture onto each item. 8. Place about 5 blueberries on each frosted cinnamon roll. 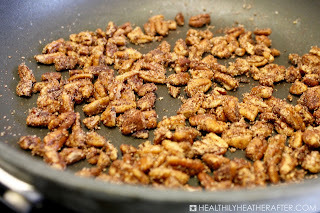 Then sprinkle the cinnamon sugar pecans on top, pressing down slightly to allow them to stick to the frosting. 9. Drizzle the icing that was included in the cinnamon roll package over the breakfast pizzas. 10. Make sure to refrigerate any leftovers. Best served at room temperature! 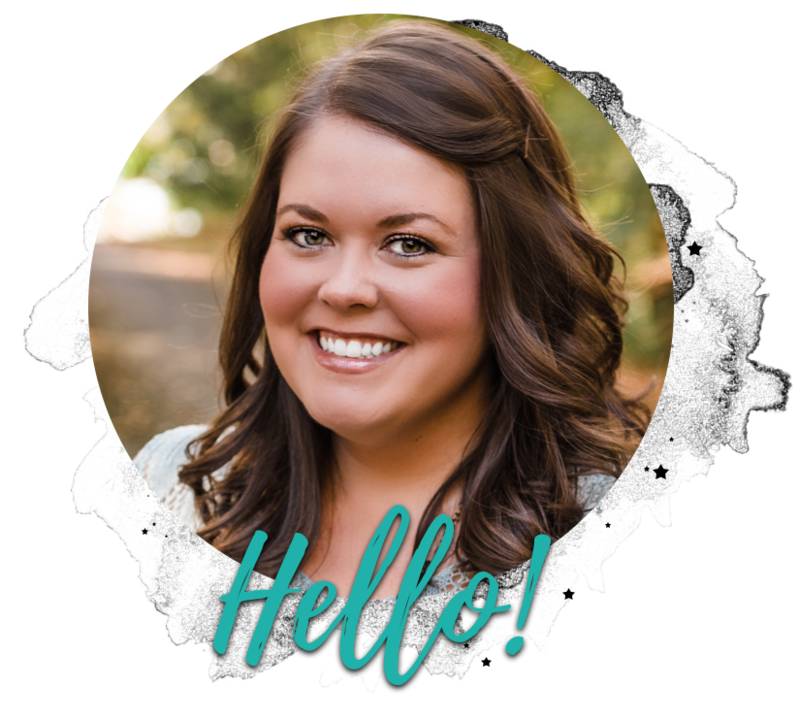 The recipes I create are always based on flavors and ingredients I personally love, and anyone who knows me can attest to the fact that I simply can't get enough spicy foods! My Cheesy Cajun Chicken Alfredo Pasta has just enough cajun seasoning to give it that little kick, which is balanced out perfectly with rich, creamy alfredo sauce. 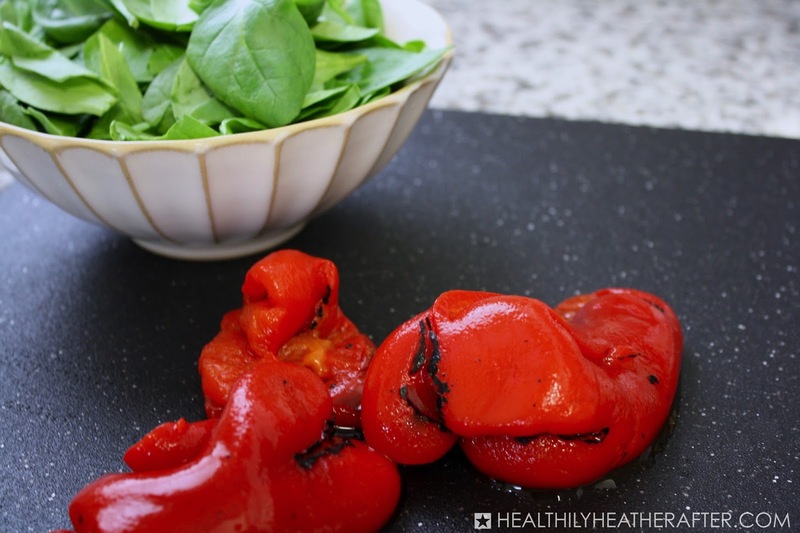 Other noteworthy ingredients in this tasty comfort food dish include fresh baby spinach, roasted red peppers, and both parmesan and mozzarella cheese. After all, you can't go wrong with cheesy pasta! 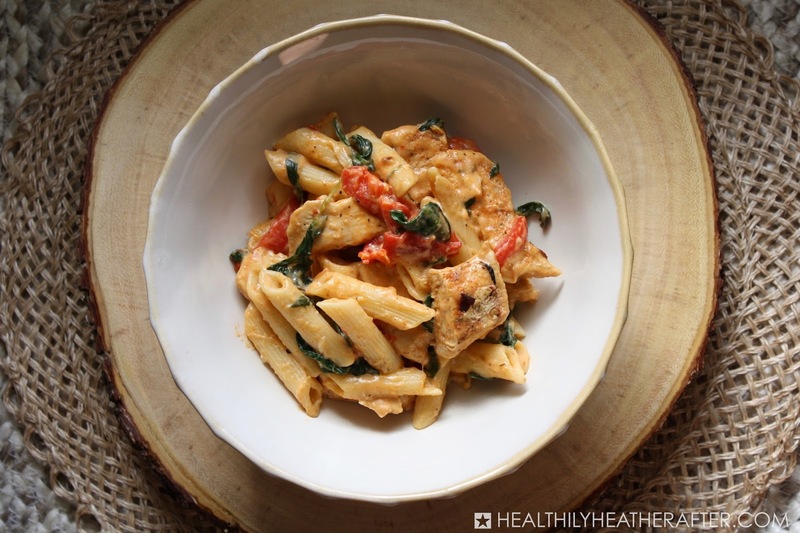 I think this is a meal the whole family will enjoy, but if you're nervous about the level of spiciness, you can definitely use less cayenne pepper and/or omit the red pepper flakes! I like to serve this dish, which comes out to 9 SmartPoints per 1.5 cup serving, with a side salad to get in a few more veggies! If you end up with extras, this recipe also tastes just as good the next day as leftovers! 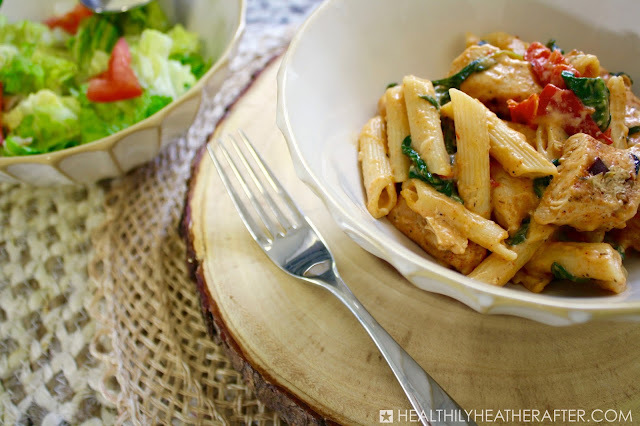 Enjoy this spicy, cheesy pasta dish that incorporates some of my favorite flavors with a side salad or all on its own! 1. Cook pasta according to package directions and drain. 2. Meanwhile, put salt, pepper, oregano, cayenne pepper, crushed red pepper flakes, garlic powder, and paprika in a small bowl and mix until combined. 3. While pasta is cooking, heat the olive oil in a medium-size skillet over medium-high heat. Add chicken. 4. Sprinkle about half of the spice mixture over the chicken, turning chicken over after 3-4 minutes. Sprinkle remaining spice mixture over the chicken and cook for another 3-4 minutes, or until chicken is completely cooked through. Set chicken aside. 5. Mist a large pan with cooking spray, and add roasted red peppers. Cook over medium-high heat until soft, about 3 minutes. Add the baby spinach and cook until wilted. 6. Lower the heat to medium and add the alfredo sauce, stirring until hot. 7. 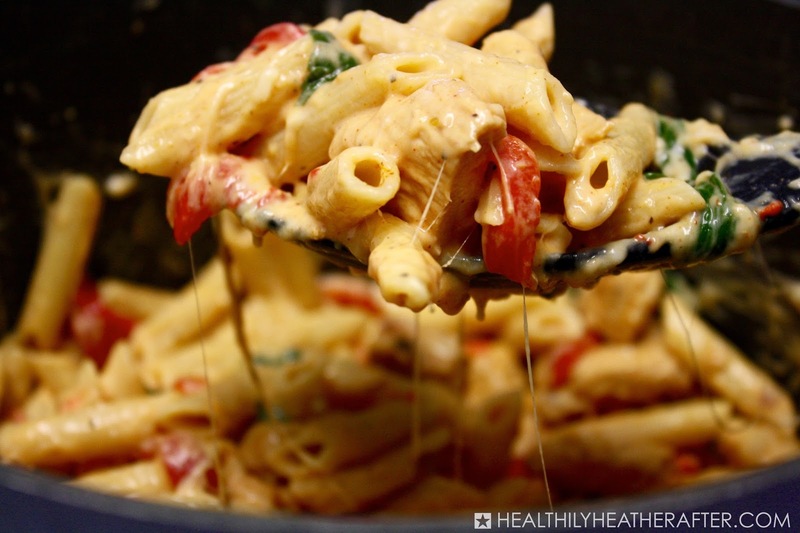 Add the pasta, chicken, mozzarella cheese, and parmesan cheese to the sauce mixture and stir until well-combined. I've loved s'mores for as long as I can remember, and I personally believe whoever decided to combine chocolate, marshmallows, and graham crackers in one delicious, campfire treat was a genius of sorts! So, I decided to incorporate these same flavors into one of my favorite desserts - brownies! You can't go wrong with brownies or s'mores in my opinion, and to make it even better, this recipe is not only incredibly easy - it's also just 5 SmartPoints per brownie cupcake! I hope you enjoy these little treats! 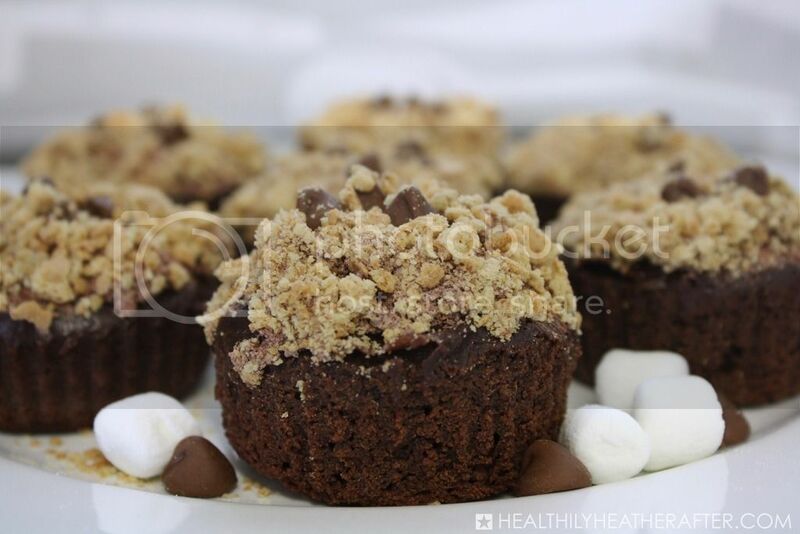 This recipes packs the traditional s'more flavors into a delicious brownie cupcake! 1. Preheat the oven to 350 degrees (325 for dark pans). 2. Line a muffin pan with 12 liners and spray each with non-stick cooking spray. Set aside. 3. 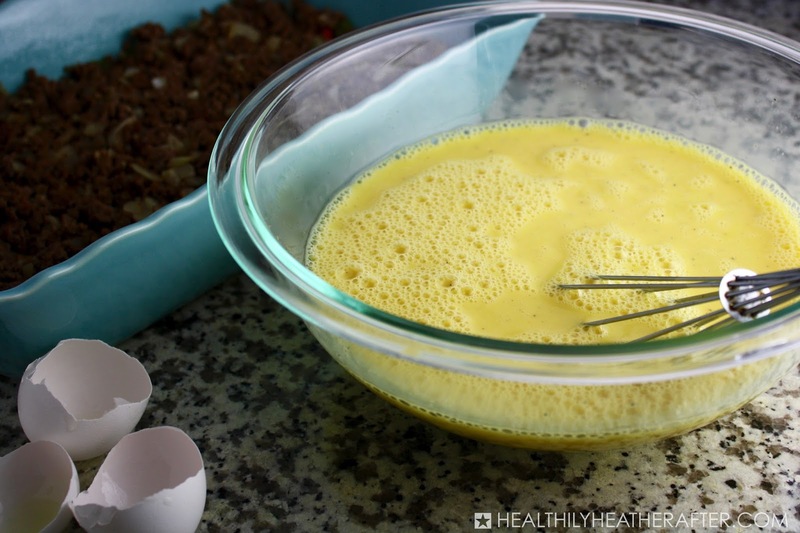 In a medium-size mixing bowl, combine the brownie mix, unsweetened applesauce, oil, water, and liquid egg whites. Stir until well blended. 4. Spoon the brownie mixture evenly into each cupcake liner and bake for 23-25 minutes. 5. While brownies are baking, crush the graham cracker sheets in a small bowl and set aside. 6. Remove brownies from oven and allow them to cool almost completely. Remove from liners. 7. Spread 1/2 tablespoon of marshmallow creme on each brownie cupcake, then top with 3 chocolate chips. 8. 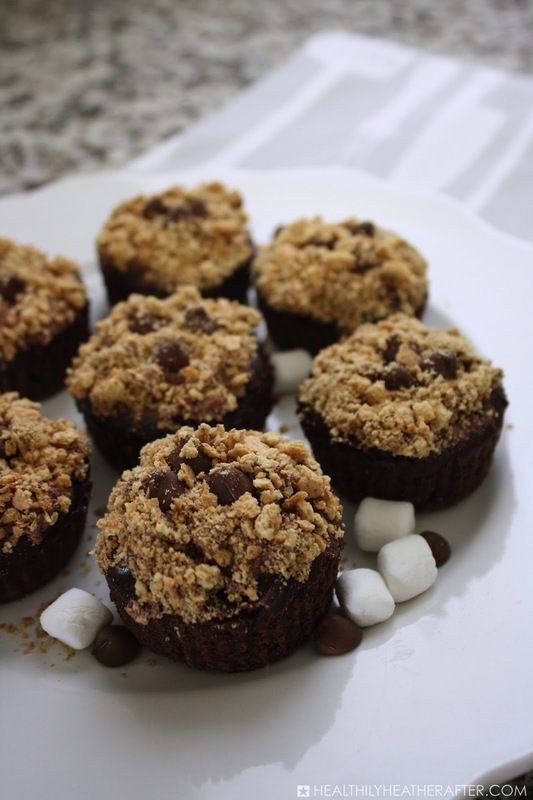 Place each brownie cupcake topdown into the crushed graham crackers to evenly coat the marshmallow creme.